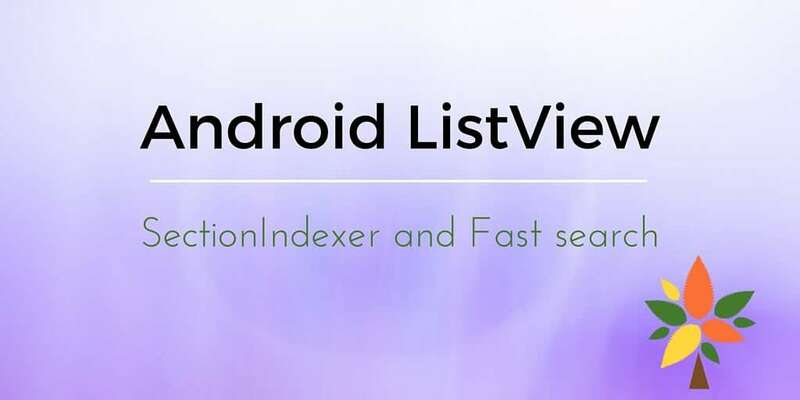 This tutorial describes how to use Android ListView SectionIndexer to enable fast search. Android ListView has a method that enables the fast scroll called setFastScrollEnabled. To enable Android ListView SectionIndexer, we have to pass a true value to our Android Adapter and it must implement SectionIndexer. I want to create a custom component using Android ListView SectionIndexer so that we can move fast along the ListView items selected by the first letter. When the user touches the screen on the fast scroll bar area, moving his finger up and down, then the ListView scrolls to the first item starting with the letter selected by the user in the scroll bar. Otherwise when a user moves his finger outside the scroll bar the listview scrolls as always. What we do here it is quite simple. In the first lines, we calculate the real width of the scroll bar and the starting point along x-axis. Then we draw a rectangle (canvas.drawRect) with a semi-transparent background. The next step we need to get the indexSize, it means how big it is the space between each letter. The last step is to write the letters inside the rectangle (scrollbar). To make this example working you need to create and adapter i called SimpleAdapter. I have derived this adapter from ArrayAdapter. If you want more information about it you can refer to this post. The first method getPositionForSection simply retrieves the position inside the listView given a section index. In our case, it is quite simple because to know the listview position we have to find the first item that starts with the letter corresponding to the section index. If we suppose that our section index string is a simple string from a to z to obtain the letter we can simply use getCharAt. Then we iterate over the listview items and find the first one starting with this letter. The other method getSectionForPosition is not implemented because we don’t use it. The last one getSections simply converts our string index into an array of objects. We will use this method in our custom listview. In the custom component when we set the adapter, we simply create a string array with all sections. At the end of this post, you gained the knowledge how to use Android ListView with SectionIndex. I'm sorry if it takes too muc time to load. Thanks it works now. Now, the problem is that I have implemented this list view in an android dialog and on clicking the list item it doesn't close the dialog. It is not even calling the onclick event of list view. Not sure if it is clashing with onTouchEvent? I'm interested on your comment because i didn't consider this aspect, using the listview in a dialog. I will test it. If you can you can send to me the skeleton you are using so that i can do it faster. so basically I have created a custom spinner which when you click on opens the dialog with list view on it. Now when you select item it should close the dialog and selects the spinner with the selected option. If you comment the onTouchEvent() method, it works fine but I want to implement both of the functionalities in my custom spinner. Thx for your suggestion. I will try to reproduce the error and then i will modify the code. Thx for your support again. Sorry our author, I have a wondering here. When I stroke to the customized listview (Up or Down) it scrolls a small distance. That's not as smooth as the original listview. So, what do I have to do to make it smooth like the original? please upload code for indexbar dynamic set fullscreen all A to Z allphabets in screen ? Something weird is happening with the timeout of the letter that is painted on the screen. However, after this delay, once the letter has been removed, it doesn't show again when I use the scrollbar again. Oops, posted the code multiple times by accident. Sorry our author, I have a wondering here. When I stroke to the customized listview (Up or Down) it scrolls a small distance. That’s not as smooth as the original listview. So, what do I have to do to make it smooth like the original? Though it looks nice, I don’t think this method can support all cases. For example, what if there are more than the English alphabet to show? It will get very condensed and un-readable. I prefer the way that default fast-scroller is shown. What I’d like to know is how to do the same for ListView, and also maybe customize it to look like the way it looks on Lollipop (including the bubble). Though it looks nice, I don't think this method can support all cases. For example, what if there are more than the English alphabet to show? What I'd like to know is how to do the same for ListView, and also maybe customize it to look like the way it looks on Lollipop (including the bubble). Yes of course, it depends on the way you created the layout. Probabily you set layout_height = match_parent. If you like you can post the layout. I have even tried with setting height as 100sp.